It was meant to bring an end to the tens of thousands of deaths caused by contaminated drinking water in Bangladesh and West Bengal, but the deep wells dug to provide what was thought to be safe water has resulted in what’s described as the worst mass poisoning in human history. The book, written by Professor Andy Meharg, an arsenic expert at the University of Aberdeen, details the tragedy which began when tubewells were dug in the Seventies to prevent the many deaths from cholera, typhoid and dysentery which often followed the consumption of contaminated surface water. The arsenic is being released into the groundwater in the tubewells via naturally occurring aquifer conditions. Professor Meharg, who visited Bangladesh last year, said: “The water that was meant to bring life has brought death. The people affected by this crisis are among the poorest on earth. They suffer floods, cyclones, famine and disease. A populace could scarely be less capable of coping with poison in its drinking water - a poison which has no taste and no immediate side effects. The Professor of Biogeochemistry, who studies and teaches the impact of pollutants on the environment, also compares in his book the Asian situation with that in other parts of the world where drinking water is tainted with arsenic, such as the Southwestern USA, the Alto Plano of South America and New Zealand’s volcanic regions. Venomous Earth also charts man's use of arsenic - between 3500 and 2500 BC arsenic-containing minerals were central to the development of bronze. It also chronicles how it was used by alchemists, in farming, medicine, manufacturing and in beauty products. The book includes details about the acclaimed poet, artist and designer William Morris, who Professor Meharg identified as a user of arsenic and other toxic chemicals to provide the vibrant green colour for which his wallpapers are famed. The book also contains accounts of arsenic's role in the Vietnam War and the decisions made by George W Bush over the chemical. 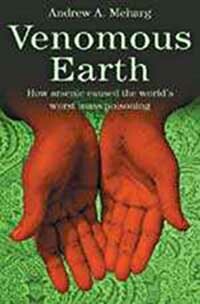 Venomous Earth is published by Macmillan on January 17. · Gilbert Skene, Professor of Medicine at King’s College, Aberdeen, wrote the first black death treatise in English in 1568, describing an outbreak in Edinburgh. In this document he describes how small cakes of arsenic were worn under the armpits to ward off buboes - swollen lymph glands caused by bubonic plague. · The 19th century was awash with "cure all" arsenic medicines, the most famous of which was patented by the Edinburgh University trained Thomas Fowler. Fowler's Solution was championed by his teacher, James Begbie, Vice-President of the Royal College of Physicians of Edinburgh, and Queen Victoria's physician in Scotland - leading to speculation that the queen herself partook. Charles Darwin, another Edinburgh University Student, did take arsenic to treat his eczema. · It was the African explorer David Livingstone who was the first to use arsenic drugs to treat sleeping sickness - half a century before Paul Ehrlich's "magic bullet" - the arsenic based drug Salvarsan, derivatives of which are still the only (partially) effective drug against this disease. · The most notorious of 19th century arsenic poisoners, the Glaswegian Madeleine Smith, escaped notoriety following the murder of her lover, escaping on a Scottish "not proven" plea, by throwing herself into Pre-Raphaelite London society, ending up as an embroiderer to William Morris and wife to William's foreman George Wardle. William's rival in love for his wife Jane, the poet and painter Dante Gabrielle Rossetti, wrote a nasty play for Jane where Madeleine poisons William. Morris himself had many arsenic links, his early wallpapers were produced with dangerous arsenic pigments, while he was on the Board of Directors of the largest arsenic mine in the world, producing over half the world's arsenic. Madeleine escaped punishment as she said she purchased arsenic for cosmetic purposes, something she had read about in "Chambers Edinburgh Journal". The "Journal" was the first British newspaper to break the story of Austria peasants from Styria routinely eating deadly quantities of arsenic to improve their health and complexion. · Annoyed by an arsenic poisoner who had escaped justice in London the chemist James Marsh developed a forensic test to detect minute quantities of arsenic - giving birth to forensic chemistry. His test was first described in "The Edinburgh Philosophical Journal" in 1838. · In the 19th century the people of Greenock had a fatal fascination for green, often observed in papers used to line grocers shops and in lurid green food colouring used for sweets and cake icing. Unfortunately the green colour was achieved using poisonous arsenic pigments. A cake decoration so coloured had the inscription "for the bairnies" - it contained seven times the fatal adult dose of arsenic. This experience pervaded the Scottish attitude to green confection well into the 20th century with the Professor of Forensic Medicine at Glasgow University in 1954 stating "Fewer green sweets are sold in Scotland than in any other country" going on to say "It is astonishing why the idea of green colour in confections should suggest the stupid impression that arsenic is present".